Youth motivational speaker and Amazon bestselling author Jeff Yalden recorded Episode 28 of The BOOM Podcast as he was getting ready to fly out to speaking gigs in St. Louis, Missouri and Harrisburg, Illinois. He began by giving a huge shout-out to a few people in his close circle of friends for coming to the aid of his fiancée Janet’s 91-year-old mother, who had suffered a fall while the pair were out on their boat on Labor Day. “We had to reach out to a couple of friends that were able to get there within minutes, and I can’t thank them enough,” he said. Yalden added that relationships are like a bank account. What you invest in it emotionally, you can take back out. 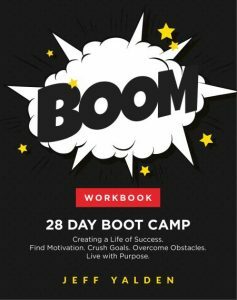 Yalden has been laying out daily principles of his brand-new workbook and planner, The BOOM 28 Day Boot Camp: Creating a Life of Success. Find Motivation. Crush Goals. Overcome Obstacles. Live with Purpose. Over the past few days on The BOOM Podcast, Yalden talked about rewriting your plan, SMART Goals and making adjustments. The BOOM Boot Camp is the perfect companion to Yalden’s Amazon bestselling book, BOOM! One Word to Inspire Action, Deliver Rewards, and Positively Affect Your Life Every Day. The BOOM principles can change your life, but you must be committed to putting in the work necessary to make your plan a reality. “You invest in your car. You invest in education. But some of the important things that need to be invested in, we don’t make a priority,” he said. Your NUMBER ONE INVESTMENT PRIORITY should be to INVEST IN YOURSELF. If you invest in yourself, you will find that you are more able to then invest in your family and in your close circle of trusted friends. Contrary to what you might think, investing in yourself is far from selfish. And as you turn up the BOOM – make sure that your efforts line up with your expectations. Does your effort match the result that you are expecting? Take personal responsibility for the little things. When we take care of the little things, the bigger things start to happen. LISTEN to this episode of The BOOM Podcast. GRAB your copy of The BOOM 28-Day Boot Camp Workbook. ORDER Jeff’s Amazon Bestseller, BOOM! One Word to Inspire Action, Deliver Rewards, and Positively Affect Your Life Every Day.